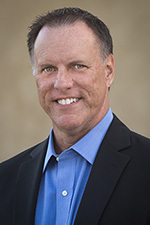 GoToMyPC | Richard M. Hicks Consulting, Inc.
DirectAccess connections are bidirectional, allowing administrators to remotely connect to clients and manage them when they are out of the office. 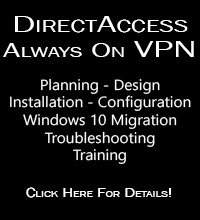 DirectAccess clients use IPv6 exclusively, so any communication initiated from the internal network to remote DirectAccess clients must also use IPv6. If IPv6 is not deployed natively on the internal network, the Intrasite Automatic Tunnel Addressing Protocol (ISATAP) IPv6 transition technology can be used to enable manage out. According to Microsoft’s support guidelines for DirectAccess, using ISATAP for manage out is only supported for single server deployments. ISATAP is not supported when deployed in a multisite or load-balanced environment. “Not supported” is not the same as “doesn’t work” though. For example, ISATAP can easily be deployed in single site DirectAccess deployments where load balancing is provided using Network Load Balancing (NLB). To do this, you must first create DNS A resource records for the internal IPv4 address for each DirectAccess server as well as the internal virtual IP address (VIP) assigned to the cluster. Note: Do NOT use the name ISATAP. This name is included in the DNS query block list on most DNS servers and will not resolve unless it is removed. Removing it is not recommended either, as it will result in ALL IPv6-enabled hosts on the network configuring an ISATAP tunnel adapter. Once complete, an ISATAP tunnel adapter network interface with a unicast IPv6 address will appear in the output of ipconfig.exe, as shown here. Running the Get-NetRoute -AddressFamily IPv6 PowerShell command will show routes to the client IPv6 prefixes assigned to each DirectAccess server. Finally, verify network connectivity from the manage out host to the remote DirectAccess client. Note: There is a known issue with some versions of Windows 10 and Windows Server 2016 that may prevent manage out using ISATAP from working correctly. There’s a simple workaround, however. More details can be found here. If you have more than a few systems on which to enable ISATAP manage out, using Active Directory Group Policy Objects (GPOs) to distribute these settings is a much better idea. You can find guidance for creating GPOs for ISATAP manage out here. Simply enabling ISATAP on a server or workstation isn’t all that’s required to perform remote management on DirectAccess clients. 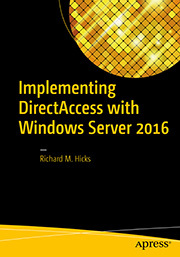 The Windows firewall running on the DirectAccess client computer must also be configured to securely allow remote administration traffic from the internal network. Guidance for configuring the Windows firewall on DirectAccess clients for ISATAP manage out can be found here. The configuration guidance in this post will not work if DirectAccess multisite is enabled or external load balancers (ELB) are used. However, ISATAP can still be used. For more information about enabling ISATAP manage out with external load balancers and/or multisite deployments, fill out the form below and I’ll provide you with more details. Once ISATAP is enabled for manage out, administrators on the internal network can remotely manage DirectAccess clients wherever they happen to be. Native Windows remote administration tools such as Remote Desktop, Windows Remote Assistance, and the Computer Management MMC can be used to manage remote DirectAccess clients. In addition, enterprise administration tools such as PowerShell remoting and System Center Configuration Manger (SCCM) Remote Control can also be used. Further, third-party remote administration tools such as VNC, TeamViewer, LogMeIn, GoToMyPC, Bomgar, and many others will also work with DirectAccess ISATAP manage out. Interested in learning more about ISATAP manage out for multisite and external load balancer deployments? Fill out the form below and I’ll get in touch with you.